Set against a backdrop of a global recession and an uncertain future political and economic landscape, UK higher education’s role in knowledge exchange remains a critical part of the innovation ecosystem, on which lies many policymakers’ hopes for future long-term growth and economic recovery. HEFCE’s recently published report; ‘Strengthening the Contribution of English Higher Education Institutions to the Innovation System: knowledge exchange and HEIF funding’, shows how universities have embedded knowledge exchange activities into the heart of their mission. University’s knowledge exchange work is funded through a complex arrangement of sources, however the most significant contribution comes from HEFCE’s Higher Education Innovation Fund (HEIF) which drives much of the social and economic impact of the knowledge exchange work that takes place across universities. 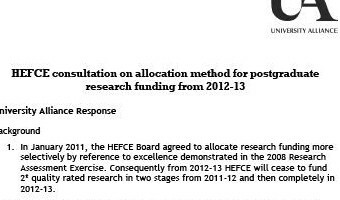 HEFCE’s report shows why HEIF funding remains such an important funding source. They show why it has empowered universities to innovate and experiment with new models thanks to its flexibility and its ability to fund any form of knowledge exchange where other sources may come with far more strings attached. The report shows that critically, HEIF is one of only a few funds that can be used as a leverage to secure funding from other sources for knowledge exchange. However, this ability comes with added risk because if universities lose HEIF funding, the overall loss is magnified as leveraged funding also falls away. HEIF remains an incredibly attractive investment for the taxpayer. 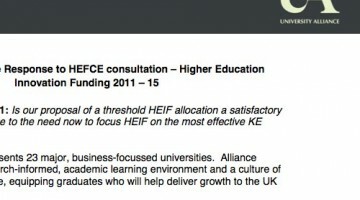 Estimates place the return on HEIF as £1 for every £6 invested, although this probably underestimates the ultimate benefits to the economy and society thanks to the positive changes it makes to university’s approach to knowledge exchange in the long term, and the many knock-on benefits for employment and skills that may arise. 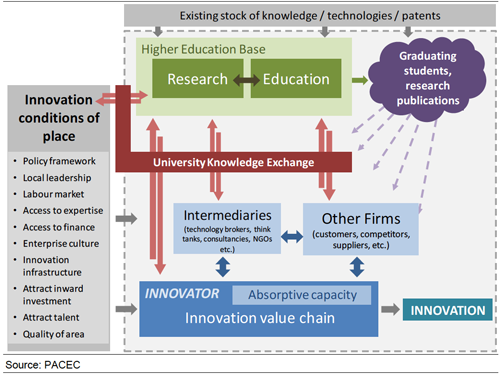 There are challenges ahead, not least thanks to the recession, which has made it harder for universities to make the case to private sector partners that knowledge exchange activities might be right for them. This is why they are diversifying around the world, bringing in further funding and showing why UK is such a vital export industry. The HEFCE report offers a framework for understanding the role of universities in knowledge exchange. Although slightly clunky, this framework breaks down the contribution of universities in to the following key areas: the role they play in contributing the stock of knowledge through publications and in educating the future workforce, the direct contributions they make to support innovation; and the important roles they play in creating and strengthening the underlying innovation conditions of place: the factors that create a conducive environment for innovation and lead to a competitive place that can attract and retain resources and high value added, innovation-driven organisations. It also demonstrates the increasing recognition of the two-way knowledge flows, with users having an important role to play in helping to shape and influence the research and teaching agendas. 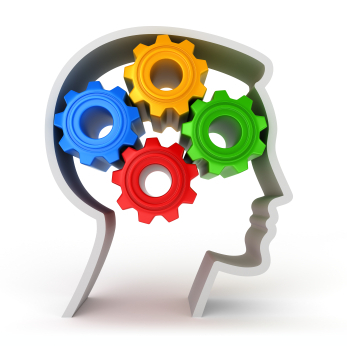 Universities knowledge exchange activities are tremendously diverse and cross disciplines, giving innovators many different points in the chain at which they can engage. HEFCE’s report shows this diversity to be one of the key strengths of knowledge exchange. 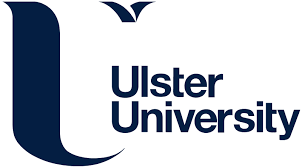 It is also a central plank of University Alliance institutions’ strategies for knowledge exchange; it is not just something that happens in one department or faculty, it is activity at the core of the mission and spans everything they do, often crossing traditional disciplinary divides. As we head into another Comprehensive Spending Review next year, universities will be considering how they can step up their interaction with the private sector to support growth and innovation. They will also be equipping their students to be tomorrow’s workforce and continue to drive the momentum of the UK’s economy. This work is rarely talked about in the press, but it is having an important and lasting impact on the economy and wider society making it a win/win for students, universities, business & industry, the Government and ultimately; the taxpayer.